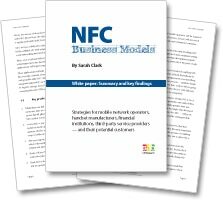 The new white paper introduces a number of concepts that are fundamental to understanding the NFC market opportunity and includes details of ten of the most important findings from our NFC Business Models research report. A white paper based on the executive summary and key findings from our NFC Business Models research report is now available to download free of charge. “NFC is attracting interest from an ever growing number of banks, retailers, transport operators, advertisers and other businesses around the world,” says Sarah Clark, editor of NFC World and author of NFC Business Models. “Understanding of the business models that will succeed is still in its infancy, however, and there is much confusion over what is actually involved in successfully delivering NFC services, who needs to be involved in planning the infrastructure required and the kind of company that is best positioned to profit from NFC. “Our NFC Business Models research report sets out the latest thinking from around the world on what successful NFC services will look like, the building blocks that will need to be put in place in order to drive adoption of NFC services, the roles and responsibilities of each of the numerous players in the market and the business strategies that are most likely to succeed,” Sarah explains. The NFC Business Models white paper is based on the executive summary and key findings from the full research report. It introduces a number of concepts that are fundamental to understanding how the NFC market will evolve and includes details of ten of the most important findings from the full report. The white paper can be downloaded free of charge from the SJB Research website. Google planning NFC payment trial in New York and San Francisco?